Machine bits for drilling flat bottomed holes in wood and some plastic . Metal cutting bits that can drill a variety of different sized holes. Named after the inventor, these bits are capable of drilling very precise holes in timber without splintering or marking the face. They can drill into end grain or through timber veneers and laminate surfaces. A forstner that has a gold coating to promote longer life. 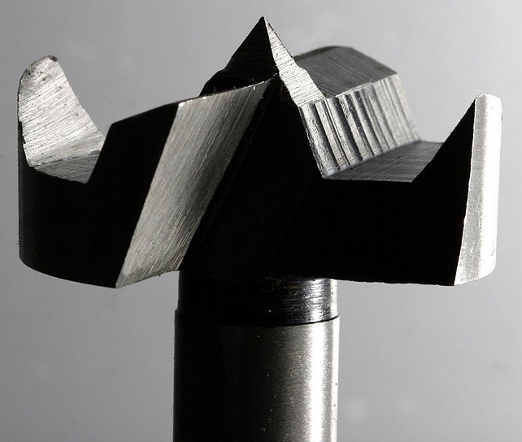 Because of the design these bit are not used in hand tools as they need a lot of downward force for them to cut well. Most often they are used in a drill press where they perform excellently. They come in many different sizes. Both of these appear to be about 35mm which is a popular size for these bits as it is used a lot for the fitting of European style cabinet hinges. The cup hinge requires a hole of say 12mm deep in a maybe 16mm door panel. Not much room for error, going slightly too deep with the point of the bit could seriously mar the face of the door. These bits handle this job with ease as the point only goes in maybe 2mm deeper than the flat base of the hole. A Couple of tree bits. 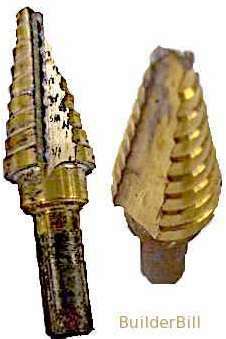 One size of bit can drill different sized holes in fairly thin metal. We often used steel "C" or "Z" purlins bolted to steel cleats. If the purlins were not pre-punched then we would use a tree bit to make the 14mm or 18mm holes in the purlins. A pre-drill hole about 6mm then it was a case of "burp, burp, burp" with a tree bit and the hole was done, just as fast as saying it. Using a conventional 14 or 18 diameter HSS machine bit in a hand held drill is always a tense thing, the danger of the bit grabbing is very real. The step bit removes this danger, there is simply no grab. This no-grab feature makes it very easy to open up or make wider existing holes. Many times I have used tree bits when a couple of holes in steel plates have been slightly out of line. A bit of this type can do a lot of work, but eventually they need sharpening and that is not an easy job. 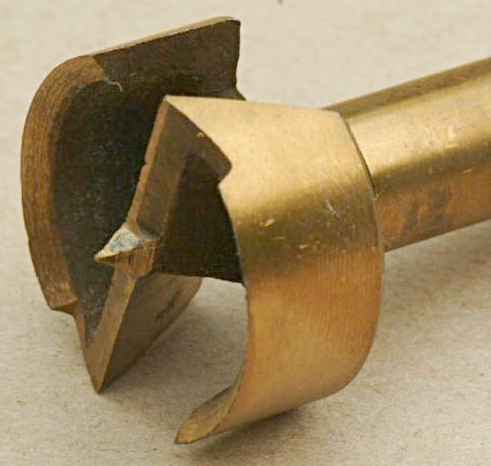 One way to extend their life is to always pre-drill a starter hole with a standard, easily sharpened bit. So saving the more expensive bit for the work that it does best, drilling larger holes.